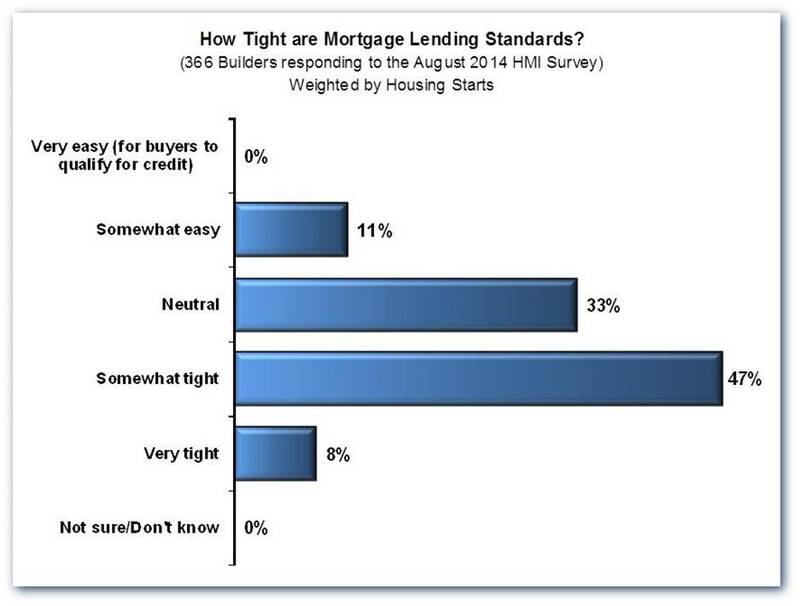 In an August survey asking single-family builders to describe mortgage lending standards in the areas where they build, well over half indicated that standards were tight or very tight. Only 11 percent indicated that lending standards were somewhat easy and none described them as very easy. The survey took the form of special questions appended to the monthly instrument used to generate the familiar NAHB/Wells Fargo Housing Market Index (HMI). 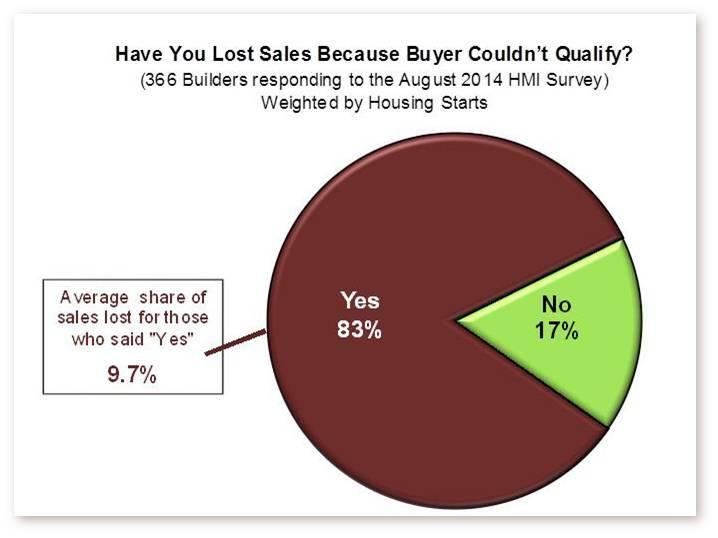 In addition to the general question on lending standards, the survey asked builders if they had lost any sales over the last six months because the buyers couldn’t qualify for a mortgage. Eighty-three percent answered “Yes.” Of these, the average share of sales lost was 9.7 percent. Responses tended to vary by size of the builder, so all the numbers reported here are weighted based on the number of homes a builder started in 2013. The HMI survey is transmitted electronically early on the morning of the first working day of each month, so a question about sales lost during the last six months in the August survey translates to sales lost from February through July. During that period, the Census Bureau’s monthly series shows that a total of 233,000 new homes were sold. If 83 percent of builders (weighted by size) lost 9.7 percent of their sales, it works out to an estimate of 18,700 new home sales lost in that six-month stretch because the buyers were unable to qualify for mortgages. The 18,000 sales builders lost directly to tight mortgage standards are a drop in the bucket compared to the sales they lost because their customers lost sales on their existing homes for the same reason. Any builders who think they are unaffected by what happens in the existing home market, are sadly mistaken. The new home market cannot flourish until the first-time buyer problem is solved. This is good information. Why are so many not qualified? Are homes still under valued? Should banks take a look at the raising home value and demand for 2015 2016 and 2017. Supply and demand laws economics should allow them to require less equity. Are credit scores too long term? A lot of question from this survey need to be researched and answered to grow our economy.